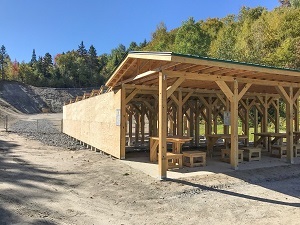 MONTPELIER, Vt. –The Vermont Fish & Wildlife Department reminds us that two of its shooting ranges are open for sighting-in rifles before you go hunting -- one in Hartland and the other near Island Pond. Both ranges are open for public use from April to mid-December. West Mountain Shooting Range in East Haven has a 100-yard shooting range and target frames at 25, 50, 75, and 100 yards. ​ The range is located on the South American Pond Road on the West Mountain Wildlife Management Area. Users 15 years of age and older are required to have a valid Vermont hunting or fishing license and may bring one guest.